Home › Business › Which Way for the CBA Now? Which Way for the CBA Now? Commonly used technical analysis tools, Fibonacci retracement and extension numbers, can be helpful in monitoring appropriate entry and exit points for trending stocks. An earlier post dated February 14, 2013 set a target of $74 for bell-whether financial stock, the Commonwealth Bank of Australia. This target was briefly met ($74.18) on Monday, May 20,2013, before falling $6 to $68. Fibonacci extension target set at $74. Target Price briefly met arguably forming a double top, before retreating. It has announced an unaudited profit for the 3Q 2013 of $1.75 billion, up 2.7% on the earlier quarter. Profit for the 1H 2013 was $3.576 billion, a 7% increase on the previous half. It appears to be set to be the first Australian Bank to exceed a full year profit of $7 billion. The 4 major Australian Banks kept their AA credit rating, when 15 other global major banks have been down-graded, placing them in the top echelon of world banks. The banks have enjoyed a stellar increase in their share-prices over the last 12 months, leading the way for the rise in Australia’s market indices. This has been so meteoric that some analysts have referred to it as a bubble in financial stocks, and have suggested that current prices are unsustainable. The Australian Banks still enjoy P:E ratios of the order of 14%-15%; to call this a bubble is an over-statement. A pull-back is likely however from profit taking. The banks offer long-term investors a handsome fully franked dividend stream of at least 5-6% yield, in addition to steady capital gains. Hence one would expect a limited fall with the shares likely to trade within a range of about 10% for the next few months. Where will CBA find support? 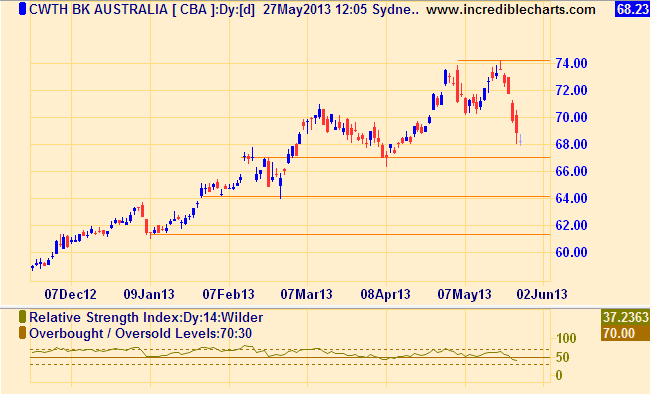 The fall in CBA’s share-price this past week has been so precipitous, that one would expect further falls. The next support levels are at about $66.50 and then at $64. Should these not hold, the 38.2% Fibonacci retracement level is at $62. 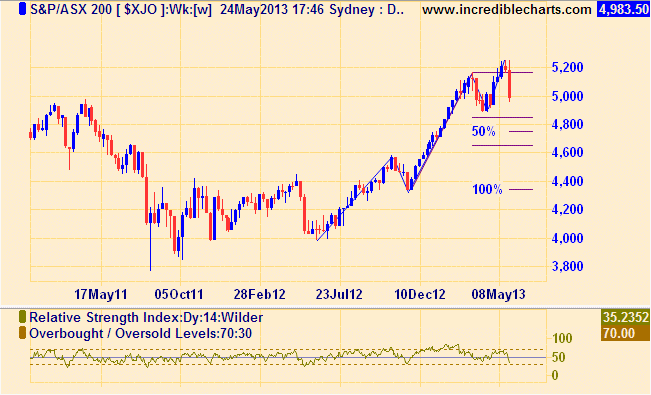 I would be surprised if the retracement were to exceed this. After finding support, one would expect the share price to rally again, perhaps trading in a range between $64 and $70 until later in the year. 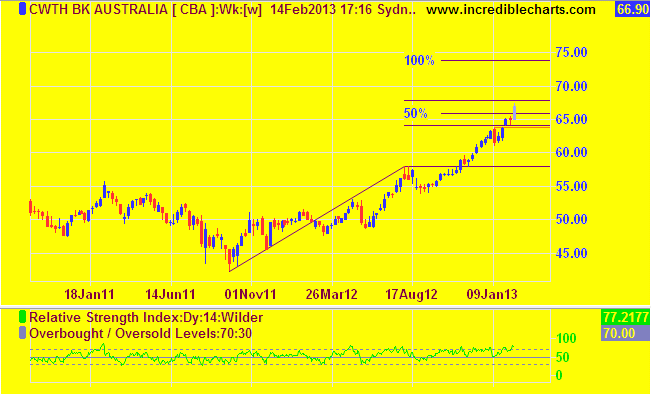 ‹ Weekly Aussie Market Focus, May 24, 2013, Market baulks at the half way recovery mark. Australian Agricultural Company – A Premier Agribusiness.